The meringue is crispy, airy and tasty treat made of egg whites. Love it and the adults and children. 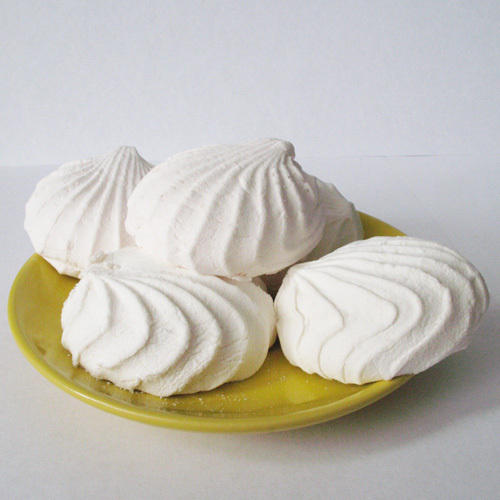 As the meringue can be used to create more complex desserts and decorating cakes. Follow certain rules when cooking and you certainly will succeed! Carefully separate the whites from the yolks. Eggs must be fresh and chilled. Not allowed even a drop of yolk in the whites! Prepare a bowl for whipping. It should be clean and dry. This also applies to beaters from the mixer. Prepare the powdered sugar. To do this, simply grind sugar in a coffee grinder. 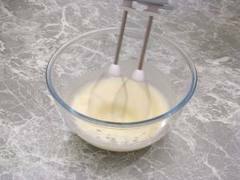 Whisk whites with a mixer at first on low speed, gradually increasing it. You should get a fluffy white foam. Only then add a tablespoon of powdered sugar. Continue whipping. The resulting dense foam for meringue should not fall out from the bowl when turning. Time it will take approximately 15 min. Put the foam in a piping bag and place on a baking sheet sprinkled with flour. You can do the same and teaspoons. 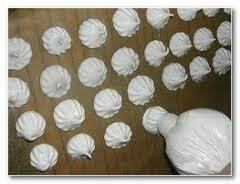 Bake meringue in a preheated 100C oven for an hour or two, depending on size of cakes. Remove from the oven only after they cool down.